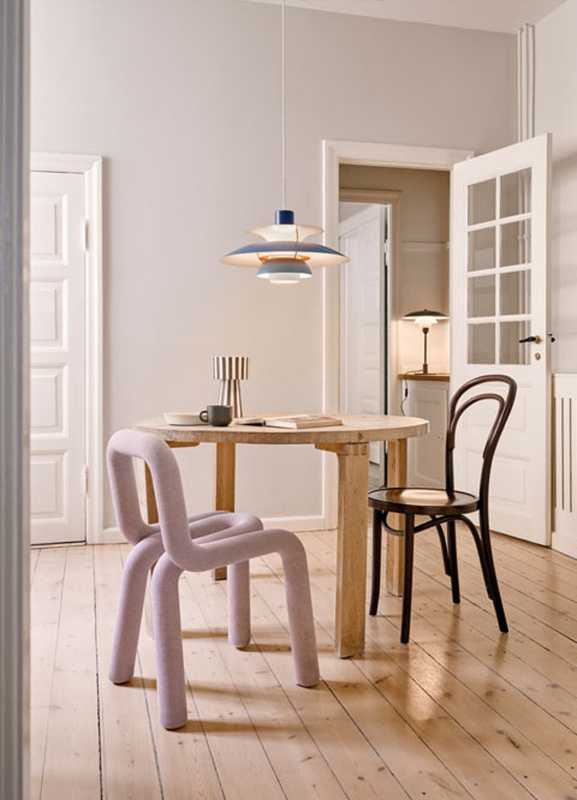 Poul Henningsen developed the PH 5 in 1958 for Louis Poulsen as a response to the constant changes to light bulbs at the time. "I have designed a PH fixture which can be used with any kind of light source, Christmas lights and 100 W metal-filament bulbs." The name PH 5 came from the size of the 50cm wide main shade and over time has seen many updates to accommodate changing light sources. In the early 90's it was modified to accommodate an energy saving light bulb. The metal plate was also changed to a frosted glass plate to be more energy efficient. Just a few years ago a new set of 5 high gloss colors were introduced to the public.